This archive holds all posts form October 2009. More Driving While Black (DWB): Are Parts of the US a “Police State”? You can drive into this dusty fleck of a town . . . if you’re African American, but you might not be able to drive out of it — at least not with your car, your cash, your jewelry or other valuables. That’s because the police here allegedly have found a way to strip motorists, many of them black, of their property without ever charging them with a crime. Instead they offer out-of-towners a grim choice: Sign over your belongings to the town, or face felony charges of money laundering or other serious crimes. More than 140 people reluctantly accepted that deal from June 2006 to June 2008, according to court records. Among them were a black grandmother from Akron, Ohio, who surrendered $4,000 in cash after Tenaha police pulled her over, and an interracial couple from Houston, who gave up more than $6,000 after police threatened to seize their children and put them into foster care, the court documents show. Neither the grandmother nor the couple were charged with or convicted of any crime. But civil rights lawyers call Tenaha’s practice something else: highway robbery. . . . David Guillory, an attorney in nearby Nacogdoches who filed the federal lawsuit, said he combed through Shelby County court records from 2006 to 2008 and discovered nearly 200 cases in which Tenaha police seized cash and property from motorists. In about 50 of the cases, suspects were charged with drug possession. But in 147 others, Guillory said the court records showed, the police seized cash, jewelry, cellphones and sometimes even automobiles from motorists but never found any contraband or charged them with any crime. Once the motorists were detained, the police and the Shelby County district attorney quickly drew up legal papers presenting them with an option: Waive their rights to their cash and property or face felony charges for crimes such as money laundering — and the prospect of having to hire a lawyer and return to Shelby County multiple times to attend court sessions to contest the charges. According to a prominent Texas state legislator, police agencies across the state are wielding the asset-forfeiture law more aggressively to supplement their shrinking operating budgets. people for no reason, take their cash, spend it, meanwhile filing no charges of wrongdoing. All the while, the authorities of East Texas or wherever could count on a federal court order that would allow them to go after the banking, tax, and employment records of their innocent victims if they tried to get their money back. . . . The discovery motions also revealed that collection accounts were not always well kept. One front-line collector argued that he kept bulk numbers only and could not provide evidence of how much money was taken on any single occasion. To get your money back from these actors, they may demand that you prove it’s not contraband and then prove how much they took. to use the forfeiture funds to pay for her defense. In early October , the ACLU filed a brief with the Texas Attorney General’s Office to prevent the forfeiture funds from being spent to defend alleged abuse of forfeiture powers. Numerous research and policy studies, including some by the ACLU, have shown that this type of racial profiling is all too common in the United States today. At least 38 people have been cited for not speaking English since 2007. Almost all of them were Hispanic and none of the officers who issued the citations were Hispanic. One stop per resident! Yet more signs of the naïveté of arguing for a “post-racial America.” And of the sad US reality of weak or no constitutional rights, in too much everyday police and other institutional practice–especially if you are not white. It has been 11 years since Matthew Shepard was beaten, tied to a lonely Wyoming fence, and left to die because his attackers hated gay men. That same year, James Byrd, Jr., was dragged to his death behind a pickup truck in Jasper, Texas, a victim of a racially motivated crime. One of Byrd’s attackers wore tattoos including the image of a black man hanging from a tree. Shepard and Byrd were not the only victims of those horrible crimes. In both cases, the murderers were not simply committing a crime against Shepard or Byrd; they were sending a chilling message to everyone who shared the characteristics of the victims. . . . The most recent FBI statistics show that there were 7,624 hate crimes in 2007. That’s almost one hate crime for every hour of every day. Most of those crimes were based on race, and many victims were targeted because of their religion, ethnicity or sexual orientation. Crimes against Latinos are on the rise, fueled in part by demonizing rhetoric about undocumented immigrants. It took a long time, but now — finally — the United States Congress has sent a resounding message of support to victimized groups, a serious warning to those who would be perpetrators and a statement of safety and security to all who live in this country. Last week, Congress passed the “Matthew Shepard and James Byrd, Jr. Hate Crimes Prevention Act,” and sent it to President Barack Obama, who has indicated that he will sign it into law. The FBI stats are considered to be quite low, since many police agencies do not report or report zero crimes. The Southern Poverty Law Center has long joined with many law enforcement and civil rights officials to get this legislation passed, and they have estimated the number of such crimes at 50,000, much higher than the FBI. President Obama just signed the legislation. After years of Republicans blocking it. Yet another sign of change that we can use in the areas of anti-oppression action and law enforcement. Is Insistence on English and Punishing Spanish about Maintaining Racial Power? Too many white Americans get upset about simple matters like adapting modestly to other languages and related cultures, sort of normal stuff in many other countries. I know Europeans who know numerous languages and associated cultures–not to mention some of my Asian-Indian students and colleagues who know even more languages and cultures. Why cannot U.S. whites adapt? he forbade the Hispanic workers at the . . . hotel from speaking Spanish in his presence (he thought they’d be talking about him), and ordered some to Anglicize their names. No more Martin (Mahr-TEEN). It was plain-old Martin. No more Marcos. Now it would be Mark. His rules and his firing of several Hispanic employees angered his employees and many in this liberal enclave. . . where Spanish language, culture and traditions have a long and revered history. . . . Former workers, their relatives and some town residents picketed across the street from the hotel. Then Whitten told some employees he was changing their Spanish first names. . . . “It has nothing to do with racism. I’m not doing it for any reason other than for the satisfaction of my guests, because people calling from all over America don’t know the Spanish accents or the Spanish culture or Spanish anything,” Whitten says. Martin Gutierrez, another fired employee, says he felt disrespected when he was told to use the unaccented Martin as his name. He says he told Whitten that Spanish was spoken in New Mexico before English. . . . After the firings, the New Mexico chapter of the League of United Latin American Citizens, a national civil rights group, sent Whitten a letter, raising concerns about treatment of Hispanic workers. . . . The messages and comments he made in interviews with local media, including referring to townsfolk as “mountain people” and “potheads who escaped society,” further enflamed tensions. The mayor, Darren Cordova, said the Whitten should have familiarized himself with the area and its Latino culture before buying the hotel and taking such drastic action. There is much that is important in all this stuff about English-only or English-centrality. The commonplace white insistence on a dominant English is often about insisting on a white framing of things and about white control. As a matter of everyday reality, Latinos, whether very longterm, multigenerational residents as here or recent immigrants, are forced to adapt to much in the white racial frame and to the dominant racial hierarchy. The mostly white-controlled major institutions across this society aggressively press them to conform constantly over lifetimes. They learn that they must more or less conform to white-normed or white-framed realities, so that they can survive in this racially oppressive society. Indeed, they adapt much more cooperatively to many of these societal pressures, such as in quickly learning and using the English language, than most whites are willing to give them credit for. Such stories about restricting Spanish and ethnocentrically accenting English are not too surprising when whites are unused to adjusting substantially to new folks and subcultures in an increasingly multiracial society where they are a minority, or soon will be. Tis learning time in the white world. It’s ok though, because the cop has apologized. I’ve written here (and elsewhere) about various forms of cyber racism, including what I’ve called ‘Facebook racism,’ at the popular social networking site. Now, there’s another form of racism online that’s worth noting: the racism that pours forth in the comments section of many news sources. Read a news story that in some way, either directly or very indirectly, touches on an issue related to ‘race,’ and then read the comments section. Almost without exception, the comments sections will be filled with overtly racist remarks from readers. AFTER READING an article on the fatal stabbing of Jasper Howard, the University of Connecticut football player, I clicked on the online section of readers’ comments. I was so saddened by the hatred and racism that clearly was behind the words people wrote. Talk about blaming the victim. I am certain that most of the people writing these comments know nothing about this young man. They feel free to write such hateful words as “this is what happens when you take all these undeserving thugs and try to make the world a better place by filling our colleges with them’’ and “colleges are experiencing more diverse problems today.’’ Anyone reading these will see how apparent it is that race is still a huge issue for so many in this country. Another person wrote “get rid of affirmative action,’’ as if that was the cause of this tragic situation. The story here is the human suffering that this murder has brought to the family and friends as well as every teammate of Jasper Howard. This young man and his team were on top of the world last Saturday evening after celebrating their win. A short time later, lives were forever changed by a senseless crime. If Howard were a white youth from Weston, would there have been the same comments? Then, adding ironic insult to the original racist comments, the comments following Pihl-Buckley’s letter generate a similar kind of animosity. The anonymity offered by online spaces provides a kind of anonymity that allows whites to share the ‘backstage’ racism that Feagin & Picca point out in their book, Two-Faced Racism. As I have written for some years now, the U.S. is moving rather rapidly to a much more diverse condition. Even a quick look at demographic data reveals the U.S. is rather rapidly becoming less white and more racially diverse. Whites are less than half the populations of Hawaii, New Mexico, California, and Texas. They are a minority in half the largest metropolitan areas. Over the next few decades they will become the statistical minority in the most populous states and all major metropolitan areas. No later than the 2040s Americans of color will be more than half the population. As we saw in the 2008 election an American of color was elected U.S. president substantially because he got the overwhelming majority of votes of African American, Asian American, Latino, and Native American voters. A substantial majority of white voters, in contrast, voted for his white Republican opponent. One significant question that these demographic changes raise is just how most whites will deal with this significant increase in racial-ethnic diversity in the future. If so, you would join a growing number of white Americans homesteading in a constellation of small towns and so-called “exurbs” that are extremely white. They are creating communal pods that cannily preserve a white-bread world, a throwback to an imagined past with “authentic” 1950s values but with the nifty suburban amenities available today. . . . I call them Whitopias. . . . [These are] whiter than the nation, its respective region, and its state. It has posted at least 6 percent population growth since 2000. The majority of that growth (often upward of 90 percent) is from white migrants. The places luring so many white Americans are revealing. The five towns posting the largest white growth rates between 2000 and 2004 — St. George, Utah; Coeur d’Alene, Idaho; Bend, Oregon; Prescott, Arizona; and Greeley, Colorado — were already overwhelmingly white. … Americans associate a homogeneous white neighborhood with higher property values, friendliness, orderliness, cleanliness, safety, and comfort. …. Race is often used as a proxy for those neighborhood traits. Actually the bits here about comfort and friendliness suggest that even Benjamin, an African American, is writing a bit unreflectively, indeed from a version of the white racial frame here. By “Americans,” he means white Americans, for overwhelmingly white neighborhoods can be decidedly unfriendly and uncomfortable (indeed hostile) to African Americans and other Americans of color. I was just in one such area this week lecturing, with some folks of color who do not exactly find the heavily white area comfortable. John McCain trounced Obama among white voters, 55 percent to 43 percent. Of the 245 U.S. counties that qualify as “exurbs,” McCain beat Obama in 209 of them, most often by double-digit margins. Yet more evidence of just how racially polarized this “post-racial America” really is. We look to our children as promises for the future, to progress beyond previous generations’ limitations, failures and injustices. We recognize and dream about “their world” — the one we’ll live in when we are seniors, the one that embodies some of our wishes and the fruits of our labor and energy. But we also know that for these goals to be reached, there must be a context within which our young people can learn, grow and thrive. We agonize over how we can improve conditions for young Americans whose future is so instrumental to ours, and we worry about kids who seem to be heading in a direction that can undermine those aspirations. THIS WEEK, we have assembled a small panel of thoughtful folks who are thinkers, writers and social justice advocates to discuss a confrontation that Stephen had with three young men who were vandalizing a subway station on Tuesday evening. We offer these perspectives in the spirit (and with the hope) of instigating positive, thoughtful discussion. Stephen’s story is below, followed immediately by Charlton’s response and then the responses of our guests. Stephen My wife and I were climbing down into the Harrison Red Line subway station in our neighborhood in Chicago when we happened upon three young Black boys — maybe 13 years old — tagging the station walls with spray paint. It was particularly surprising because there are security cameras down there, yet the kids were dancing around and acting as if they didn’t care if anyone saw what they were doing. I thought about it for a second or two and decided to let them know that I saw what they did. Rather than express disappointment or anger (I figured at that age, irrespective of race, they wouldn’t care — I wouldn’t have! ), I simply wanted them to know that they were not as quick or careful as they though they were. Even now, I’m not sure if I was trying to scare them or warn them that they could easily be caught, or if I was trying to disco urage them from doing it again. In any case, they all denied having done anything wrong, and as we boarded the train, one of the boys stuck his head in the door before it closed, called me some names, and flipped me his middle finger while another boy spray painted on the window of the train as it pulled out of the station. I spent the rest of the night thinking about whether there was anything I could have done to meaningfully intervene in those boys’ lives. Since I am a White ally, I am very conscious about not wanting to be act like, feel like or be perceived as though I need to “save” (Dangerous Minds-style) persons of color. On the other hand, as an adult who wants to see all children succeed and who knows that sometimes getting in trouble is the best thing that can happen to turn someone’s life around, I wonder if I should have tried to call a CTA employee or otherwise “bust” the kids. Further complicating the issue is the fact that with all the youth violence and gang activity in the area, saying anything to kids that age at all — particularly while they are engaging in an illegal act — probably isn’t a particularly smart thing to do. Would I have felt the same or acted in the same way if I were Black (a man or a woman — and would that matter) or if the kids were White? Would the kids have reacted to me differently? Did I act appropriately (do enough, do too much)? Charlton There’s no easy answer to this question. I suppose like many people my response to what the kids were doing would fluctuate depending on the day, my mood, and my immediate attitude about the actions these youths were engaged in. On one day, no doubt, I’d be apt to say that I would approach them and say something like, “No wonder why some people see kids like you as nothing more than ignorant thugs.” It’s the kind of thing that comes to mind when you are looking at someone from your own racial group reinforcing the dark shadow of prejudice on those of us who have tried so hard to overcome those perceptions. But I’ve also noticed recently that I seem to be getting older. As I do, I find myself distanced from young Black teens not so much because they are Black, but because they are adolescents — adolescents who seem to attempt more today than I would have ever thought possible to get away with when I was their age. And I admit part of me would have stood silently with my wife, not uttering a word to the kids — in fear of their potential volatility and need to remain and keep my loved ones safe from potential harm. If I were wearing my charitable, racially and socially conscious hat that day, I may have spent a moment not only contemplating acting — confronting the young men — but thinking through the implications of my actions. If I report them to the authorities (“authorities” — I feel like I’m in a 1970s Japanese monster film) then these youth will probably be swept into a criminal justice system likely to impact them more negatively than the subway wall they were tagging. So no, don’t report them; they probably deserve a chance that they probably won’t get if the cops get a hold of them. If I were to say anything — not wanting to incur the wrath of some pent up anger, or send them on a one-way trip through the American criminal and judicial process — I may have just asked them why. “Hey — why are you guys doing this?” I’ve always found that if you ask someone a question he or she will do one of two things. Some will ignore you, and others will answer the question. If they answer the question, you’ve taken the first step to engaging in some form of meaningful dialogue. This, I think, would be the best possible outcome — and opportunity — I could imagine in this situation. Jessie Daniels The encounter that Stephen describes is a vexing situation for those of us who count ourselves as white allies for racial equality. As he describes the exchange, it is one bound up with white racial privilege (and, one suspects, class privilege). The image of the white professor chastising the young, black grafitti artists (or merely vandals) and their understandably angry response, seems like a reenactment of larger scripts about race and class in the culture. I think it’s also important to bring up the issue of gender and sexuality in the dissecting of this story. If I had been in that situation, and I had seen those young men while I (also a white professor, and a woman) had been with my partner (also a woman), I would not have said anything to a group of adolescent boys – whatever their race – for fear of retaliation that was more aggressive than a raised middle-finger. As a lesbian-identified woman, groups of adolescent boys raise the possibility of a different kind of threat for me. So, for me, the fact that Stephen feels he can call out these young men is completely bound up in his own position of privilege at the intersection of race and class, as well as gender and (hetero)sexuality. If the underlying issue here is about how to intervene in the lives of young, black youth who may have gone astray on the path toward adulthood, full citizenship and participation in the broader society, I would echo what others have said here about community engagement. I wonder if Stephen knew the names of these young men? He doesn’t say, but my guess is that he did not. Did he ever have a conversation with them prior to the exchange around the graffiti? Without a personal connection in which you at least know the young men’s names or have had a conversation once before, an encounter such as this one is doomed to replay hierarchies of race and class. And, just so you know that this not all theoretical for me, I’ll close with a story from my own life. I attend a multi-racial, queer church called Metropolitan Community Church of New York (MCCNY). MCCNY has for 8 or so years run a shelter for LGBTQ homeless teens. The shelter is open 365 nights a year, and operates in the basement of the church building. The kids who reside there come from all over, are predominantly black and latino, and are mostly homeless because they have ‘come out’ to their families and been rejected by them. These young people are struggling – often heroically – to survive in difficult circumstances. They are also teenagers. As such, they not infrequently act out in ways that are just not acceptable. If I see unacceptable behavior by one of the teens and act in ways to correct it, I am in a similar position to the one that Stephen was in. I am white and a professor, and thus have racial and class privilege in relation to these young people. All of our interactions are always going to be inflected by those differences. However, that does not mean that I look the other way when I see a young person putting themselves in harm’s way. I intercede when I can. I’m mostly likely to take action – and to be effective – when I know a young person’s name, I’ve talked with them before in some non-confrontational exchange, and they have a sense that I care about them beyond the interaction in which I’m telling them that they’ve messed up. Dr. Jessie Daniels is an Associate Professor at Hunter College. She is cofounder and frequent blogger at RacismReview and you can follow her on Twitter. As a society, we have chosen to not uphold desegregation laws. We have chosen to allow low income children of color to receive a substandard education, simply because they live in a different zip code. We have chosen to not pay a living wage so that people can actually have the means to pursue life, liberty and happiness, so they can move out of dangerous neighborhoods if they see fit. And we have chosen to allow gangs and narcotic trafficking to run rampant, as long as it stays controlled on the “bad” side of town. As for having some sort of moral or spiritual “center” where today’s teens know not to beat one of their peers to death, that sort of center doesn’t just fall out of the sky and infect kids like Swine Flu. Yes, children and teens should know better, but we live in a do-whatever-you-wanna-do culture. Self-control is in no way a part of our world these days. I’m not saying this to excuse what these teenagers did. But hello, didn’t you read Lord of the Flies as part of your education? THIS is where race and class come in. Society has surely created an environment where anti-social behavior will fester in disenfranchised youth, including children of color and the poor. And because we broke it, it is our job to fix it. It is good that you intervened, Stephen–not as a white savior, but as a concerned adult. What most of us, including me, are far more likely to do is look away and say nothing, to tsk tsk about the kids and the mamas and daddies who are raising them, to give the children in question up for lost. We look away from the loud and aggressive behavior. We look away from the loitering. We look away from the vandalism. We look away…until a teenaged boy is beaten to death on camera…and then it seems people cannot look away. And we wonder how we got here. Several immigrant rights groups have expressed their displeasure at major retailers such as Target and Amazon selling “illegal alien” costumes at their stores and online. In response, Target has pulled the product, and it is not currently available on Amazon.com. Yet, judging by comments below news articles such as this one, online readers at that site can’t seem to understand what all the fuss is about. According to an online poll, 87% of the readers of the NBC news article found the story amusing, and all of the comments below the article are unsympathetic to the cause. What’s the deal? Why are immigrant rights activists upset about the costume? The first reason is that the terminology “illegal alien” is offensive, as is its correlate “illegal.” “Illegal alien” is a popular and official term used to refer to people who do not have the proper documentation to remain within US borders. Despite being an official term, “alien” has a popular connotation as a space creature, and thus comes across as harsh when referring to human beings. Calling a person an “illegal” or an “illegal alien” is offensive and dehumanizing. It takes the emphasis off of the migrant as a person and redirects it to their presumed “illegality.” Calling migrants “aliens” further dehumanizes them. Although the costume may be considered to be a joke, the life circumstances of undocumented people in the United States are not a laughing matter. People who lack documentation to remain in the US often face abuses at the hands of their employers, and are forced to accept low wages and bad working conditions. Many long to return home to attend important family functions such as funerals, and cannot, for fear they will not be able to return and continue to secure their family’s livelihood. Many spouses live separated for years; many parents live thousands of miles from their children and depend on phone calls as their only means of communication. I am sure many of us will see these distasteful costumes on the streets on October 31. I hope many more of us will take part in actions that let undocumented migrants know that we recognize their human rights and humanity. See this for the stories of some undocumented migrants in the US. And, visit CHIRLA to find out about their current campaigns in support of migrants’ rights. At a major national community service forum at Texas A&M today, I got to hear the first sitting president I have ever heard in person. 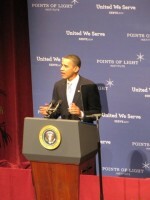 President Obama gave a strong and aggressive speech on the importance of community service and volunteerism. This was a forum sponsored by the Thousand Points foundation set up by President Bush-41 some years back. While such volunteerism has serious limits and certainly is no substitute for major structural reforms and significant action to bring an egalitarian society—and many conservatives do see it as that substitute—it does bring out the best in many Americans. In his speech, actually, Obama was careful to point out the limits of volunteer and service efforts to bring substantial change in society’s big problems of social justice, something rarely heard from politicians on this subject. The media coverage I saw (or heard about from my students) of the event and the buildup to it was often lousy and slanted toward the “if it bleeds it leads” school of contemporary journalism. They had played up the conservatism of Texas A&M University and/or the likelihood of thousands of right-wing demonstrators. Actually only 100-200 demonstrators showed up, and there were also numerous supporters of Obama who demonstrated for him. They were mostly kept far away from the campus venue too. 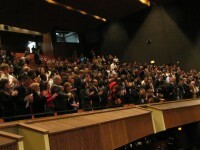 And the audience of 3000+ in the university auditorium gave President Obama by far the strongest standing ovation of the ovations given to the many dignitaries there (including Bush-41 and Secretary Gates, members of Congress, etc). Also distorted by the mass media is Obama’s political agenda and efforts. I learned today from his speech about huge supportive efforts he and his staff have engaged in to facilitate and increase community service by Americans, especially young Americans—including the Ted Kennedy service Act he signed that expands several of the service corps. See here for some information. Substantial governmental money has been put behind these efforts. Why hasn’t the media covered this rather extensive effort to facilitate community service by Americans of all ages and backgrounds? Still, I worry that such an emphasis on volunteer service, Obama’s qualifications notwithstanding, does and can deflect our national attention to getting on with the major structural changes we need to make in order to make this the substantially egalitarian society it claims to be.